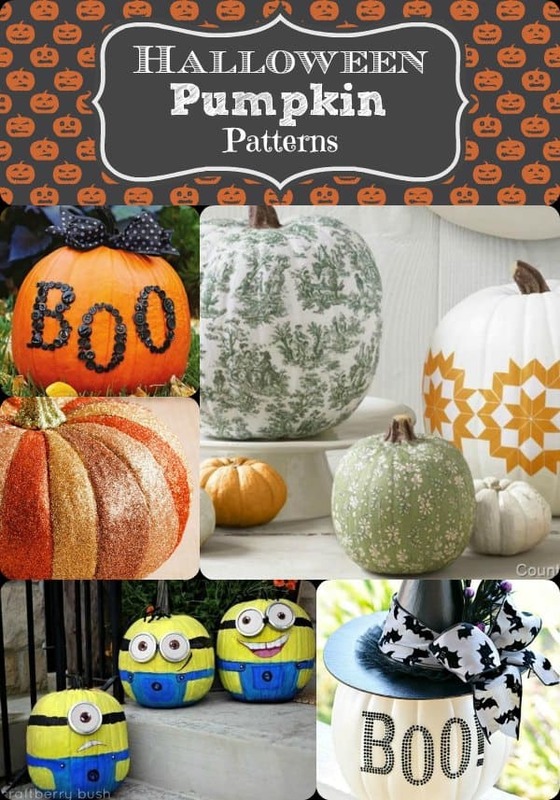 Halloween Pumpkin Patterns - Some of my favorite NO CARVE ideas!! I am so excited that Halloween is just around the corner and I can finally try some of these amazing Halloween Pumpkin Patterns! Last week we told you all about Halloween party food ideas and costumes so this week it’s pumpkins! My kiddos get to carve several pumpkins each year. But that is more of a project they do with daddy. He loves to do all different carvings and it’s sort of become a tradition. Carving isn’t really my thing. You do all that work, and before you know it your pumpkin is caved in and smells bad! Here are some of my favorite Halloween Pumpkin Patterns that require ZERO CARVING! It is suggested for several of these that you use faux pumpkins. 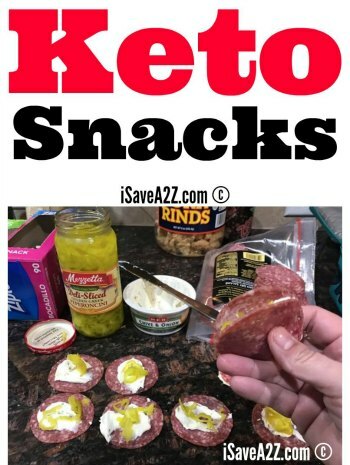 That way you can save them for next year, or take the decorations off and change it up. Decorate with Buttons: How simple is this?? With a pack of buttons and some glue, you’ll have an amazing pumpkin in no time! You can draw or trace your letters onto the pumpkin first. Then just fill in the letters with your buttons, attaching them with glue. Decorate with Glitter: I know, I know…glitter can easily get everywhere! But it makes it SO PRETTY! 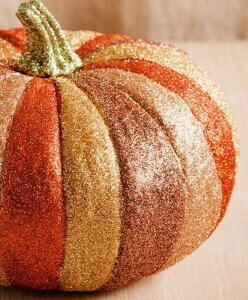 The original post on this pumpkin basically says to apply glue to the section you are working on with a paintbrush and then sprinkle the glitter on. BUT….to save you from what could turn into a HUGE MESS, I would try using Glitter Pens or Glitter Glue Pens! Much easier to work with and a lot less mess! The post also says this pumpkin may not last very long, so be sure to keep an eye on it. 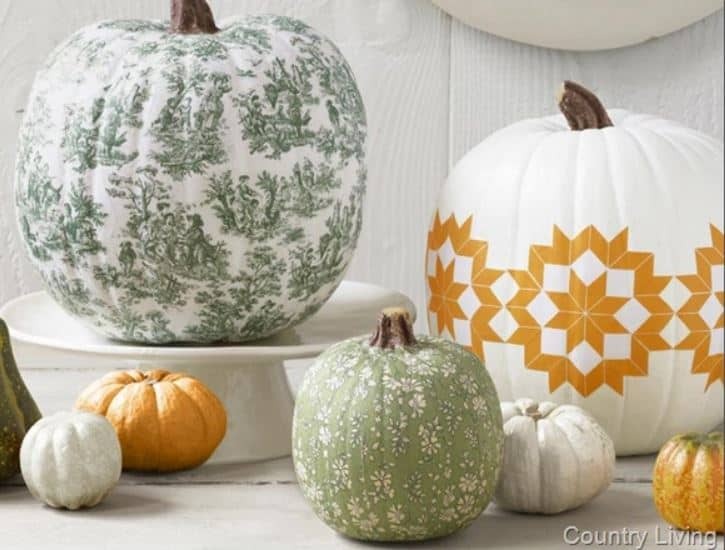 Decoupage the Pumpkin: This is an easy way to get a very detailed pattern on your pumpkin! All you need is patterned paper or a copy of a pattern and some Mod Podge. You can get a Decoupage 101 tutorial at Country Living. They do suggest using faux pumpkins for this project, but that’s up to you. If you did use a foam or plastic pumpkin, you could use them all through Fall and save them for next year. Decorate with Rhinestones: Who could say no to a blinged out pumpkin? NOT ME! I absolutely love the way this pumpkin is done. 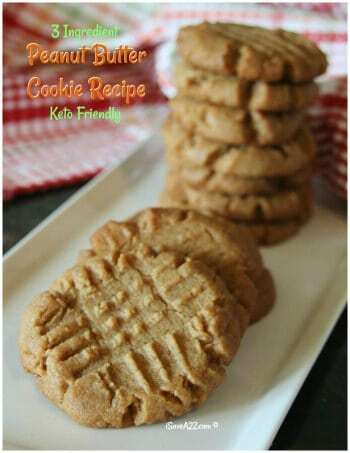 Fairly simple and so adorable! Decorate with Paint: Painting a pumpkin can give you endless options. It amazes me how many Halloween Pumpkin Patterns you can do just by using paint. Below, are a couple of my favorite ideas. My kids, like a lot of other kids around the world, are obsessed with minions right now! When they saw this first pumpkin, they went nuts. 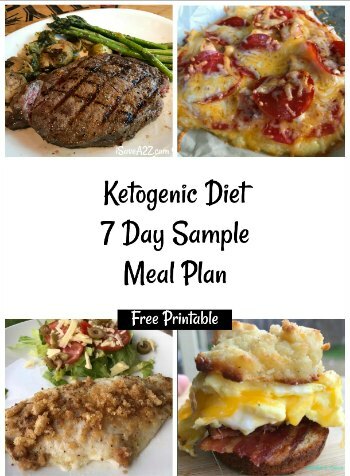 So it looks like we will definitely be trying this one! Decorate with Ribbon: This is probably the easiest pumpkin decoration that I have seen. 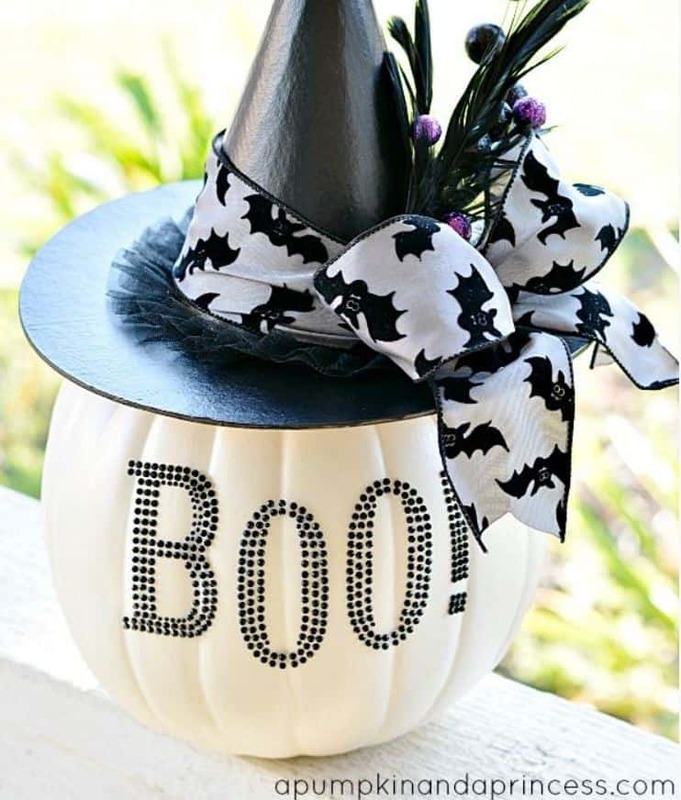 Simply place the Halloween ribbon on your pumpkin the way you want it and glue or pin it in place. 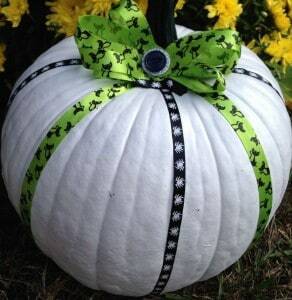 I have seen examples with the ribbon going vertical, like this one found on Pinterest, or going around the pumpkin. 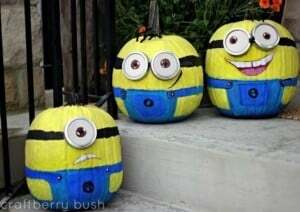 Well, that should get you started and thinking out of the box on your Halloween Pumpkin Patterns. Look around your house and see if you already have items that you could use. Push pins and chalk paint can also make a plain pumpkin fabulous! Don’t forget to check out all of our fun Halloween posts here! 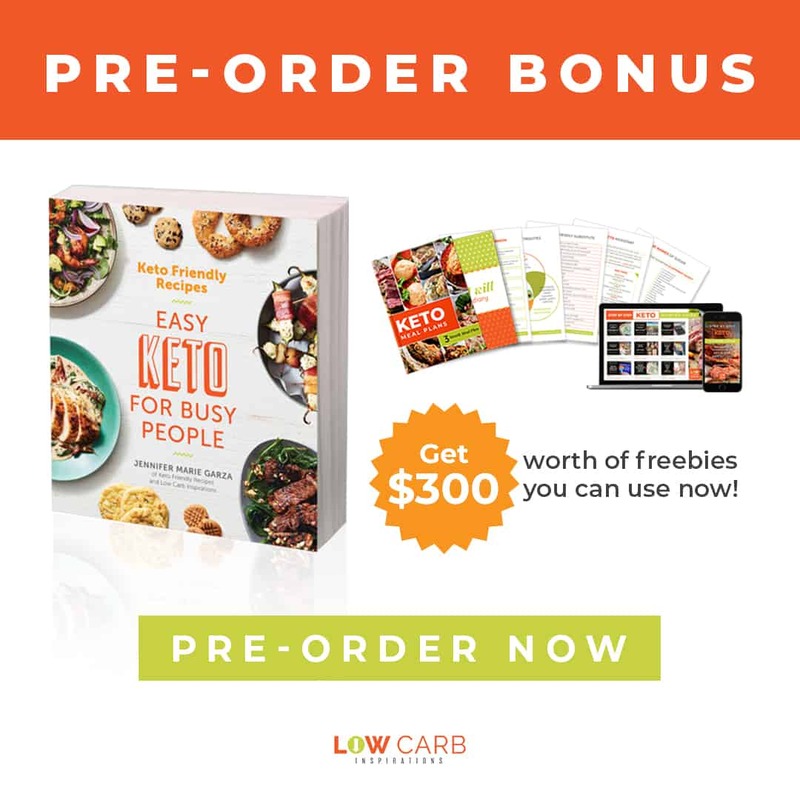 We have everything from Halloween Food to Costume Ideas with everything in between! By Jennifer on October 9, 2013 Crafts.